Is Differentiation a Dirty Word? This post addresses many of the challenges presented by those who oppose the differentiated instruction model. For an overview of differentiated instruction, see my post on What Is Differentiation Really? and The 4 Ways to Differentiate Instruction. Having worked with some of the most severely challenged students for the vast majority of my teaching career I have found adapting instruction to be a necessity. For that reason and because the range of student needs is so vast, I find differentiation to be key in my efforts. That is why I was somewhat surprised to find a few articles shared recently decrying how the whole movement behind differentiation as a failed experiment. 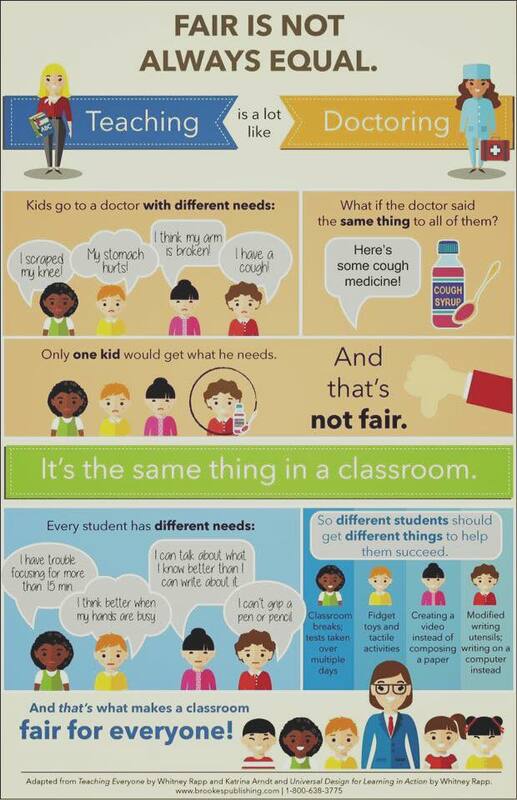 A fair classroom and an equal one are not the same as the infographic below and my personal experience would suggest, so doesn’t it make sense to adapt learning to meet individual student needs? One particular author mocks differentiation for being touted as some magic elixir to solve all that ails education though he sees it as a ‘failure and a farce’. Others claim that the requirements tend to outweigh the rewards while some have claimed that differentiation has wholly corrupted effective instruction and dumbs down teaching. These are strong views for a methodology meant to address individual student needs. My initial response is that they, like many other teachers, misunderstand what differentiation is really intended to be and the variety of ways it can be implemented. There has been a lot of poor ideas presented as differentiation that weren’t. I must credit these authors/educators though for having the fortitude to challenge any educational premise since it can be difficult to do. Teachers who challenge any educational system or belief can be viewed as heretics, so I am compelled to hear their argument even in the face of my initial disagreement with their premise. They point to a University of Virginia study that failed to prove differentiation’s effectiveness, not because flaws in the system but because the teachers weren’t doing it. They trot out an older 2005 study showing how most instructors generally stuck with utilizing direct instruction. These though seem to point more to the lack of cohesive training and the general inclination for teachers to be driven by momentum rather innovation. That may seem antithetical if your view of teachers consists of a Ms. Frizzle type ready to buck the system, but few teachers would get on their Magic School Bus even if it was parked in front of the school. I’m not saying teachers, in general, aren’t awesome compassionate caregivers who often proclaim their independence. People though are creatures of habit who tend to follow the first law of physics. We often teach the way we were taught unless we despised education and were thus unlikely to get involved in it the first place. Teaching is personal and a matter of taste often focused more on keeping up than helping struggling students catch up. 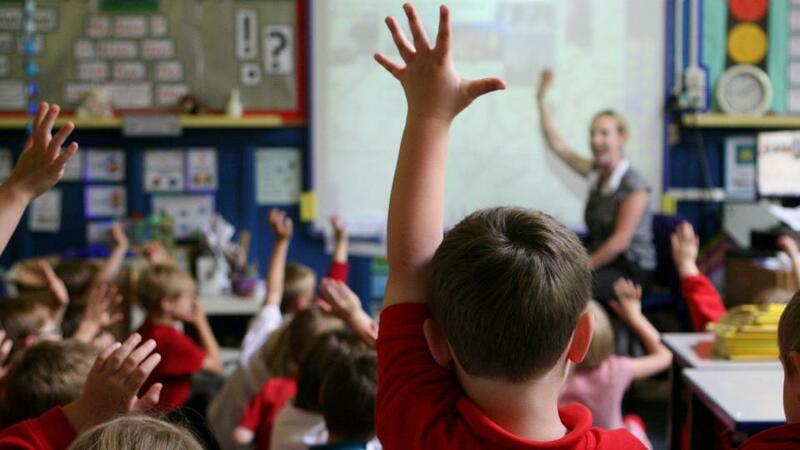 Some of the articles call the task of reaching each child an impossible one, and if a teacher has a class load of 450 students a week then it is. You can’t reach your students if you don’t know them. And that personal relationship could be prevented by too much time spent focused on state exams, too few interactive activities, intransigent curriculums, or by the sheer number of kids under your guidance. Even if, in a conducive environment, differentiation seems daunting, is that reason enough to abandon it? Would we accept it if our students told us the task we gave them seems too hard? The articles also challenge the effectiveness of differentiation (and for that matter all instruction) in a heterogeneous environment. They point to the biggest problem being a wide range of student capabilities but saying you’ll differentiate once you have the ‘perfect mix’ seems to be an unnecessary blockade. Yes, differentiation begins with knowing your kids and it will be even more effective when that is expanded to a school/district-wide scale even beyond a classroom. But that doesn’t mean it can’t begin in the classroom. As Carol Ann Tomlinson, the author of The Differentiated Classroom has said, teachers need to challenged continually just like students. Both the diversity of student needs in a class and our legal obligation to offer the least restrictive environment seem to necessitate differentiation. Also, studies show that the heterogeneous grouping benefits both low and high-achieving students. Despite this, the authors warn us that what we really need is to move towards move towards deeper discussions and to maintain rigor. That shows a misunderstanding of differentiation as dumbing down. That isn’t what is intended. Differentiated instruction (DI) should be rigorous but achievable for all students. Their response is to check for understanding, but when that understanding isn’t present their only solution seems to be to talk more in the same manner. It isn’t about novelty or innovation for its own sake which is obviously a poor goal. Differentiated instruction is about thoughtfully connecting to students and, in so doing, knowing how to best provide the information and skills they need. The articles are correct about many of the challenges related to differentiation. It helps to have smaller classes, skilled staff, a selection of resources, and administrative and parental support. Without many of these, it can seem overwhelming for all but the most determined teacher. Differentiating your lessons will often take time if you don’t have tools for efficiency in place to help (see ways to differentiate below). Differentiation does require time and space to operate, but that is a larger structural issue that impacts all instruction. It can feel foreign to an educator tied to a particular structure since it can feel like there are many disparate moving parts. Research shows that the learning curve for differentiation is difficult for inexperienced teachers and planning time is a challenge. Despite that though teachers identified a multitude of benefits including increased engagement, greater student success, student empowerment, and teacher insight. The bottom line is that it’s hard to do, but there are many hard things worth doing. No gold medal was won casually. That doesn’t make it a boondoggle. It isn’t about classic teaching versus some new age fad. It’s about knowing your students enough to build instruction that meets them where they are. It may be hard, but it’s important enough for us to get it right. Next Post What Is Differentiation Really?